The Qubino Weather Station enables you to set up your z-wave hub in a way that will allow your smart devices to respond to climate events and changes. It has been the missing link that can help help you create all climate-related scenes in your smart home. The weather station kit includes a USB key, a user manual, and two thermo-hygrometers for the purpose of gathering temperature and humidity data. 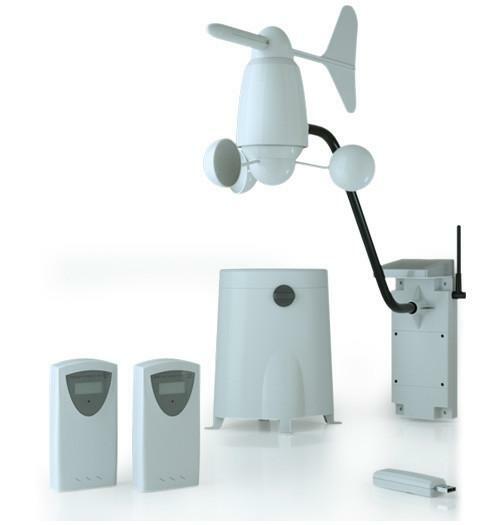 Also included is an anemometer which is just the fancy scientific name for a wind sensor as well as a separate rain sensor. The sensors transmit all collected data to the Weather Station USB Key by wireless RF in different frequencies for different regions. The wireless radio frequency (RF) has a range of up to 100 meters in an open area while the z-wave range is up to 30m indoors (depending on building materials). The USB Key just converts the telemetry it gathers from a wireless RF signal to your Z-wave network. The unit is capable of gathering the 10 measurements by default. It receives data for temperature, wind chill, velocity, wind gust, wind direction, humidity, rain rate and battery level for each Sensor. It is designed to act as repeater in order to improve range and stability of z-wave network as well. It is important to note that at the time of this review, the Qubino Weather station is only supported by HomeSeer, SmartThings Hub ( With a required custom device handler), Zipato Zipabox Smart Home Controller, and the Zipato ZipaTile Home Automation Controller. Our tests were all conducted with a Smarthings hub, if your hub is not mentioned, you may want to check with the manufacturer for support. Many manufacturers such as Vera will add support if enough users want the feature. The kit comes with pre-installed batteries, upon initial installation you must open all the units by removing the screws with a Philips head screwdriver and discarding the clear plastic tab that protects your unit from wasting batteries while in its packaging. You must do this on all sensors. Our YouTube video goes over much of the detail of the installation so make sure to watch it as things get a little tricky. The inclusion of this module to your z-wave network is a little cumbersome specifically on the smarthings hub but at least it does support which we can't say for the Vera for instance. Our weather station came from thesmartesthouse.com which offered a link to the Smart Things Hub custom device handler that is required for installation. Note that for standard devices such as light switches this step is not required so this differs from a standard z-wave device installation. It is pretty neat that you can use the Qubino weather station to see weather data at home from anywhere in the world. The weather station can be used to trigger scenes that can close the shades and turn on the AC if its too hot outside. It can turn up the heat if its too cold. You can also set up scenes to disable your z-wave controlled sprinklers if it has rained recently. Overall we really enjoy the weather station and our only wish is that more hubs would support it. Take a look at our video for more details and a close up look at the working unit. Correction: Our video states that the weather station is $200.00 but really retails for $239.95. They happened to have a sale the week the review was created.